MSPs have been told that a controversial report into Scotland's fingerprint service will not be released to a parliamentary inquiry. The probe comes out after former detective Shirley McKie's print was wrongly identified at a murder scene. 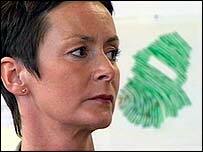 Ms McKie was cleared of perjury over the matter in 1999. Justice 1 committee convener Pauline McNeill said that without the Mackay report it would be difficult to find out what happened in the McKie case. Lord Advocate Colin Boyd has ruled out releasing the report, written by former Tayside Deputy Chief Constable James Mackay in 2000 for the Crown Office. It was made available to BBC Scotland in May and found that failures to address errors in the McKie case by the Scottish Criminal Record Office (SCRO) amounted to "criminal action". The committee is conducting an inquiry into the SCRO to help forge the way ahead for the country's fingerprint service. Ms McNeill said she had met the Lord Advocate on Tuesday morning but that he had not been persuaded to release the report for reasons relating to "fundamental principles of our democracy, including the presumption of innocence". "He made it clear this could be undermined if confidential reports to prosecution authorities, which may contain allegations of criminal conduct, were to be published," she added. 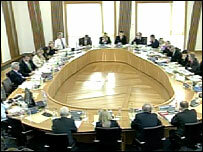 Mr Mackay gave evidence at the inquiry on Tuesday, but refused to answer MSPs' questions about his report. The Lord Advocate said in a letter written to the committee last week that the "substance" of the Mackay report was already in the public domain, but that his reasons for refusing publication had been set out already. "I am not persuaded that there is any reason for me to depart from them," he said. He said his position was "governed by principles that go to the heart of our system for the investigation and prosecution of crime". Appearing before the committee, Mr Mackay insisted: "Clearly while the report has been leaked it's not in the public domain and remains confidential. I cannot answer any of your questions." However, he did tell MSPs that several improvements could be made in the fingerprint service, including better cropping of photographs, better court presentations and a more open office culture. It emerged later that two reports into the affair are to be released to the committee. Justice Minister Cathy Jamieson has agreed to the release of a report by fingerprint expert John MacLeod, commissioned as part of the executive's defence of a civil action by Ms McKie. A separate report by Michael Pass, an independent expert, is also to be released.